Remembering Blake Nordstrom | I am grateful. My tears having been flowing much more readily than my words of late. I will now attempt to convey a little bit of the Blake I am grateful to have known and will greatly miss. 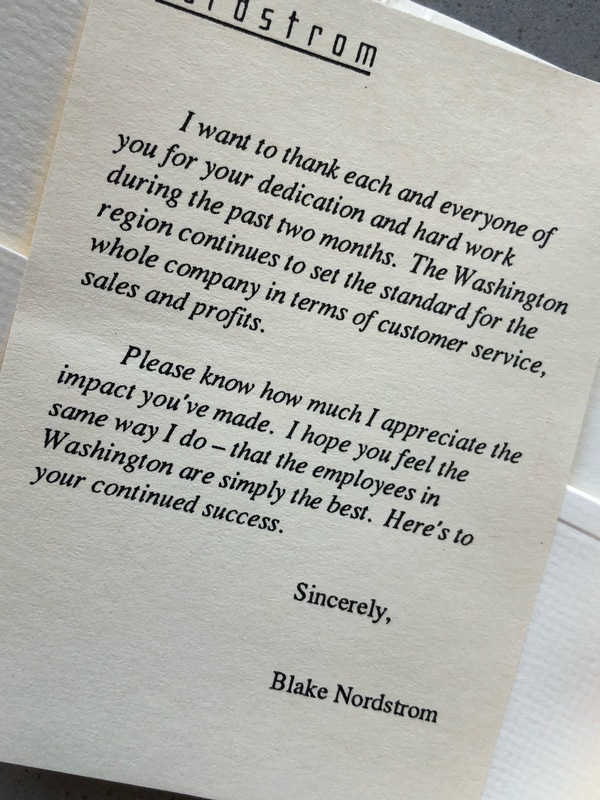 On Blake’s path to President and CEO, he had a tough (but we like to think entertaining) group of merchants to work with here in Washington. I hope this can bring a little smile to Pete and Erik’s faces since they also had to endure the POV team. Interestingly, I was reflecting on this time the evening of January 1st when I came across this business card size note from Blake, which was accompanied by a gift card. There were of course challenging times as there tend to be in our business. I’ve always considered these times, great opportunities to learn and grow. I was reminded of a big influence as to why I approach many things the way I do and the leadership we were so fortunate to have in Washington during that pivotal time. During this time, the family made some big decisions that put the company on a trajectory of substantial growth such as, building the new store 1 and closing the Place II division to focus and fund full line store growth. Blake expressed how he had never had so many upset customers reach out to him as he did with the Lacey, Washington store closure. Even in these early years of his leadership roles, it was visibly painful for him to feel that these customers were being disappointed. Fortunately for us and the community, there was no one who could have better led us through that time. In the years that followed, it would always amaze me how Blake was able to follow up or get back to me almost immediately, from his car, dashing through an airport or just picking up in his office. Not only a great listener, Blake knew the art of selective inquiry, conveying his support and taking action where necessary, always in the best interest of the company. He had the ability to make you feel that you are the priority because to him, we all were. Blake, I am beyond grateful to have known you.